Many years ago I recorded a Supertramp concert from the the TV, using a cassette recorder and microphone pointed at the TV speaker…it was how we did things in those days. My brother was having a small party of teenage friends on the same evening, so my recording was polluted with the sounds of a party going on in the background. When I played the recording back, I heard one of my brother’s friends exclaim ‘wow wee!’ at the start of one of the songs (he obviously liked it), and to this day, I can still hear that boy’s voice in my head, and do so every time I say wow wee. 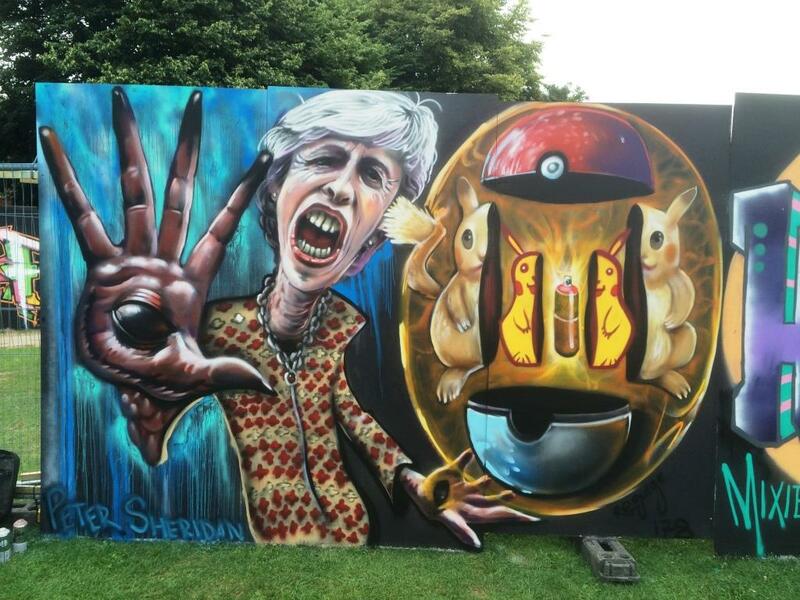 This digression is relevant only in that when I saw this brilliant piece by Peter Sheridan at last year’s Upfest, the voice in my head said ‘wow wee!’. This was absolutely one of my firm favourites from the festival. There is so much to like… the composition, the colours, the perspective and the brilliant execution. Even the observation of how the bark on this particular type of tree looks (similar to a silver birch or cherry bark). An absolute belter, and for comparison, I have included his unflattering but brilliant piece depicting Teresa May (boo) and Pokeman Go in 2016. Supertramp Live In Paris was and indeed still is a complete classic . . .
Peter Sheridan always does enough for a WOW . . . They were the first band I saw live when I was about 14 or so at the Empire Pool Wembley, supported by Chris de Burgh. Some of their tunes still have that special something . . .
Now I’m going to hear “Breakfast in America” in my ear the rest of the day. Thanks!